There is something very satisfying about planting trees. I’m not talking about the 21st century ‘instant gratification’ sort of satisfaction. More the knowledge that you are making a difference to the landscape; how it will look in years to come and the kind of ecosystem the trees will support and be part of. I find this comforting even if we probably won’t be around to see them all come to maturity. Below is an article from the FC about the massive tree planting program going on in Wales this winter. On behalf of all the SWOG team, I’d like to thank everyone for contributing to the forum, the website and coming along to this year’s meetings. Hoping to see as many of you as possible in 2012, have a very Happy Christmas, prosperous New Year and much enjoyment from your woodlands. Work that will help to shape how the Welsh countryside will look in years to come is under way as contractors set about planting the woodlands of the future. Forestry Commission Wales has begun the job of planting 2.9 million trees over an area of Welsh Government woodlands equivalent to 1,100 rugby pitches. The epic task unfolds every year as harvested areas, where trees have been cut down to feed a thriving forest industry, are restocked as part of the sustainable management of our woodlands. It’s the ultimate embodiment of the renewable nature of wood, which supports an industry employing 10,000 people in Wales and which contributes more than £840 million to the Welsh economy. 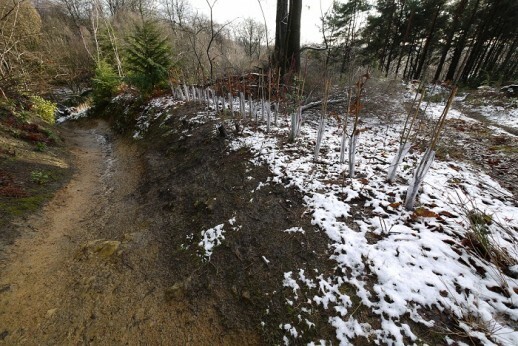 Forestry Commission Wales calls on the services of around 40 skilled contractors, prepared to brave all weathers between now and next spring, to plant a variety of conifers and broadleaf trees. The work is overseen by Wales Silvicultural Operations (WSO), which is responsible for maintaining the endless cycle of forestry after the trees have been harvested. Operations Manager Neil Muir said, “This is a very busy period for us. Managing woodlands provides rural jobs and brings economic benefits, as we rely on a skilled contractor workforce to help us with this mammoth task. Most of the trees, which come from Delamere nursery in Cheshire, will be conifers but some 730,000 will be broadleaves as Forestry Commission Wales plants a greater variety of species to make our woodlands more resilient to the effects of climate change. One of the contractors, Emrys Jones of Llangynog, near Oswestry, employs three people in his re-stocking team and together they aim to plant more than 1,000 trees every day. He said, “I’ve worked for Forestry Commission Wales for 10 planting seasons and always look forward to the challenge of a new season. The work is hard but we find it rewarding. “We cover a wide area and plant an increasing variety of species ranging from Sitka spruce, Douglas fir, oak and ash – as well as putting on tree shelters to protect the trees from mammal damage. Caption: Emrys and his team re-stocking Dyfnant forest in mid-Wales last year. Left to right: Aled Morris, Aled Jones, Emrys Jones, Jack Carnell.